“The horn from hell” – that’s how a critic expressed his views on this instrument. Time magazine has listed it in its “10 most annoying sounds” list. 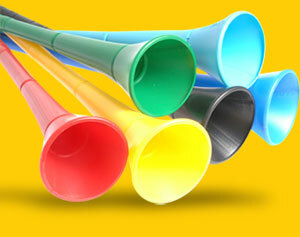 As you have guessed correctly we are talking about the Vuvuzela. It is going to remain an indelible memory of this year’s edition of FIFA World Cup. No one is sure about how Vuvuzela originated even though a musician called Freddie Maake claims that he invented the horn in the 70’s. Also the Nazareth Baptist Church came out with a demand to ban the horns at the stadiums as they consider it as their own and part of their rituals. The church uses a metal version whereas the Vuvuzelas seen in the stadium are made of plastic. The origins of the Vuvuzela can be traced back to the “Kudu” horn which was used to summon distant villagers to attend community gathering. A Vuvuzela generates a pitch of B flat below C. An anonymous musician has written a concerto in B flat for Vuvuzela, more details are here. Here is a video wherein a Vuvuzela orchestra member demonstrates the proper usage the instrument. The possibility of Vuvuzela becoming a regular instrument seems to be very remote. But it has definitely caught on the imagination or rather gathered the ire of the millions of soccer fans around the globe. So much so that Youtube recently introduced a new button to its videos. The button, denoted by a soccer ball icon, on clicking introduces the now-familiar vuvuzela drone to any video that you are watching. Not that I have seen it improve anything I watched as yet! The sound of an individual Vuvuzela has been compared to that produced by a flatulent elephant through its posterior. But the collective sounds of the Vuvuzelas resemble the hum of a million bees. Its incessant beehive buzz is posing serious headaches to the broadcasting companies covering the tournament. Accusations of ear damage and even viral infections have been made against the instrument. But the South Africans seemed to be unfazed and are blowing their own hellish trumpet. Below is the concerto I had spoken of earlier. Though musically there isn’t a lot to it, it does sound way better than how the instrument sounds over a World Cup match!